And to make matters worse, the form rejection letter provides only a vague reference to an officer’s belief that “you would not leave Canada at the end of your stay.” You know there must be more to it than that. If only there was a way to get a copy of the visa office file materials so that you could learn the “real reasons” your application was rejected. Well there is a way to get those file materials and I’m going to show you how! Should you wish to reapply, I would suggest that you do so only if your situation has changed substantively or you have significant new information to submit. If you want to have any hope of getting that refusal overturned, or a second application approved, getting your hands on your immigration Physical File is essential. It will be critical that you know what evidence, or lack thereof, influenced the officer in believing you wouldn’t go home if the visa was approved. It is only by knowing this information that you will then be in a position to provide “significant new information” on your next application in hopes of getting it approved. By satisfying the underlying concerns revealed in the officers hidden notes, you will then be able to reduce the chances of a second refusal. 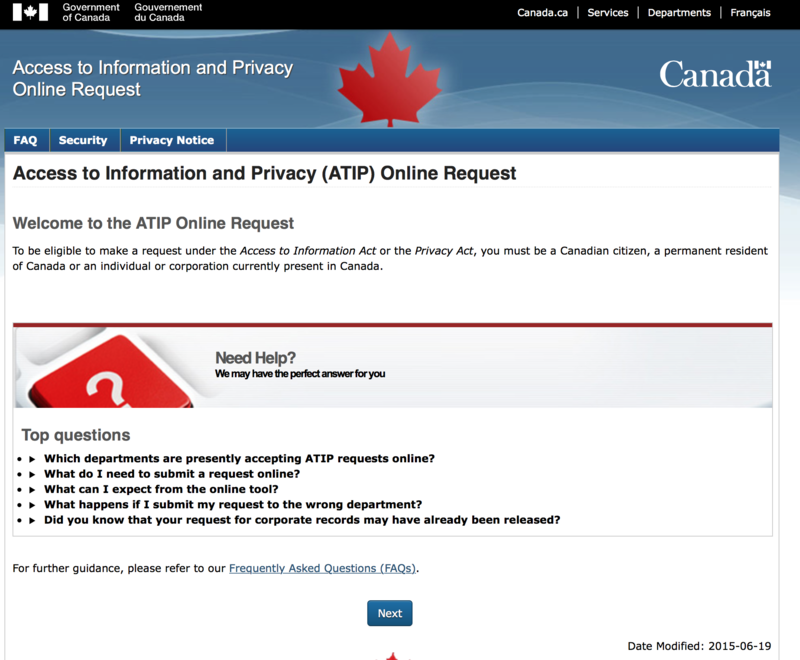 The best way to get that information is to do an Access to Information and Privacy (ATIP) request to the Government of Canada. If done properly, this request will give you copies of the actual file materials and a glimpse into the officer’s detailed “internal” reasons for refusing your application. Armed with this knowledge, you are going to be much more likely to have success on your next application. ATIPs can be used to access government information from a lot of different sources. However, we are going to focus exclusively on requesting a copy of the file materials and officer’s notes related to your rejected Canadian visa. In order to submit an ATIP request, you must either be a Canadian Citizen, permanent resident, or an individual or corporation physically present in Canada. If you are a foreign national wanting to make an ATIP request and you are not currently present in Canada, you will need to find a representative to complete this for you. If someone else is submitting an ATIP on your behalf, you must sign a consent form allowing them to do so. You can download the IMM5477: Consent for an Access to Information and Personal Information Request by clicking on this link. Please also note there is a small processing fee for CIC’s trouble in providing this information. 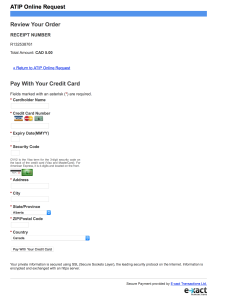 The fee is $5.00 CAD per request. An ATIP can be submitted by mail or online. I recommend filing online as it is much quicker. 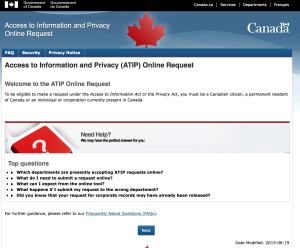 I have set out below the essential steps needed to file your online ATIP request. 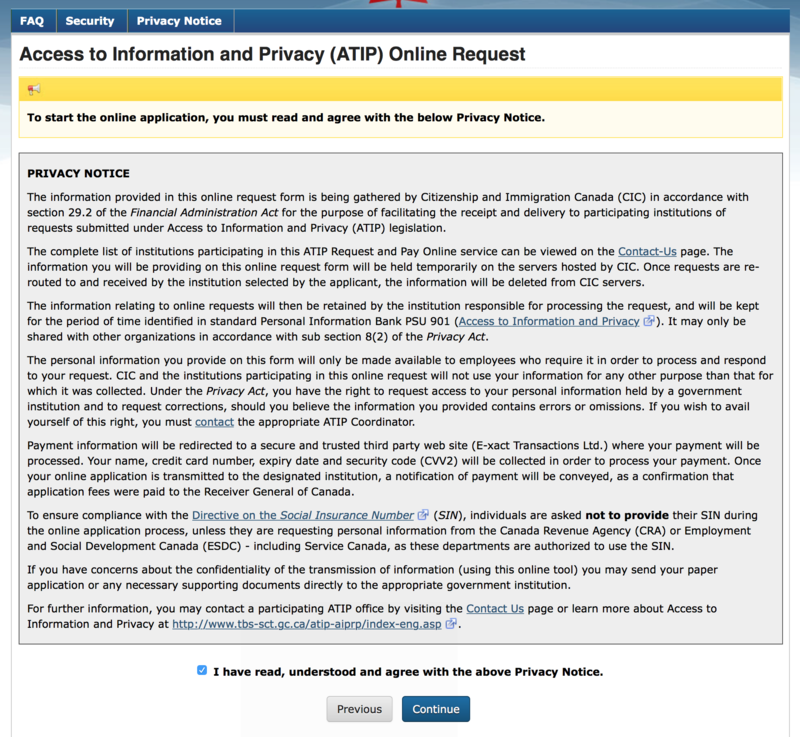 Step 1 – Go to the ATIP homepage at https://atip-aiprp.apps.gc.ca/atip/ and select your preferred language (English or French). You can skip through the “Top questions” section and go straight to the bottom and click the “Next” button. Step 2 – This will take you to the “Privacy Notice” where after acknowledging you have read and understood the privacy notice by checking the check box, you will then click “continue”. 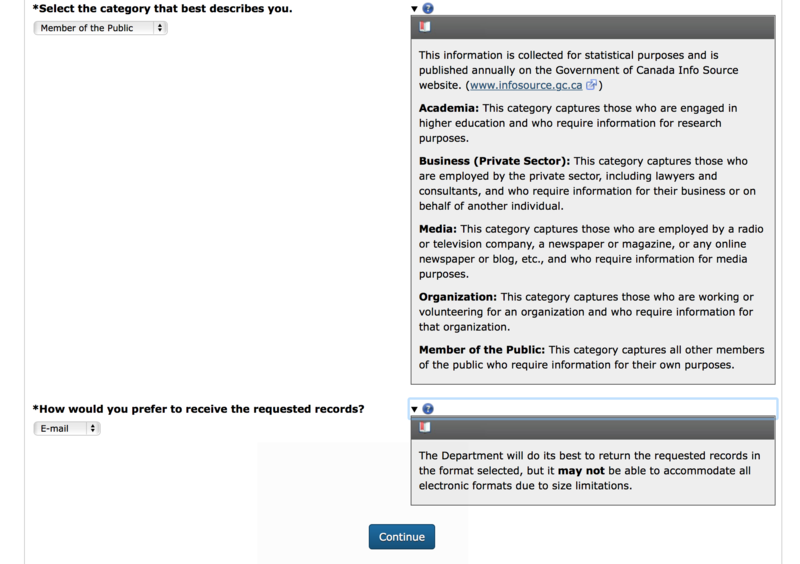 Step 3 – Next, select the Department where you wish to submit an ATIP request. 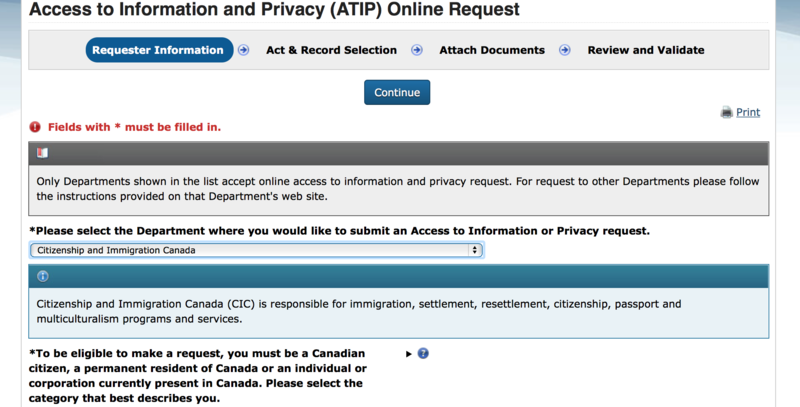 You will want to select “Citizenship and Immigration Canada”. Step 4 – On the second line, you must indicate whether you are a Canadian Citizen, Permanent Resident, Individual/corporation currently present in Canada or None of the above. Please choose the correct selection for your situation. NOTE: If you choose “none of the above”, you will not be able to submit the request. 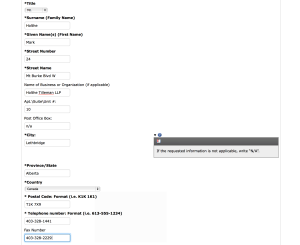 Step 5 – Enter in your full legal name, phone number and current address. Please note that a fax number is optional, however we recommend that you fill in this section if you have one. 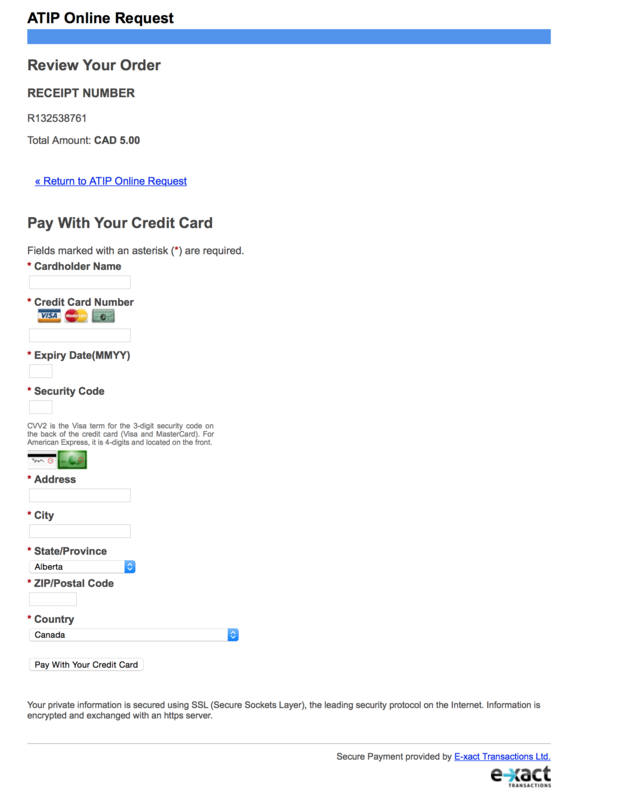 Step 6 – On the next line, it asks for an email address. Please be sure to enter a valid email address as this is often how the visa office file notes are delivered. On larger files, they may need to send a CD, which is sent to your mailing address. 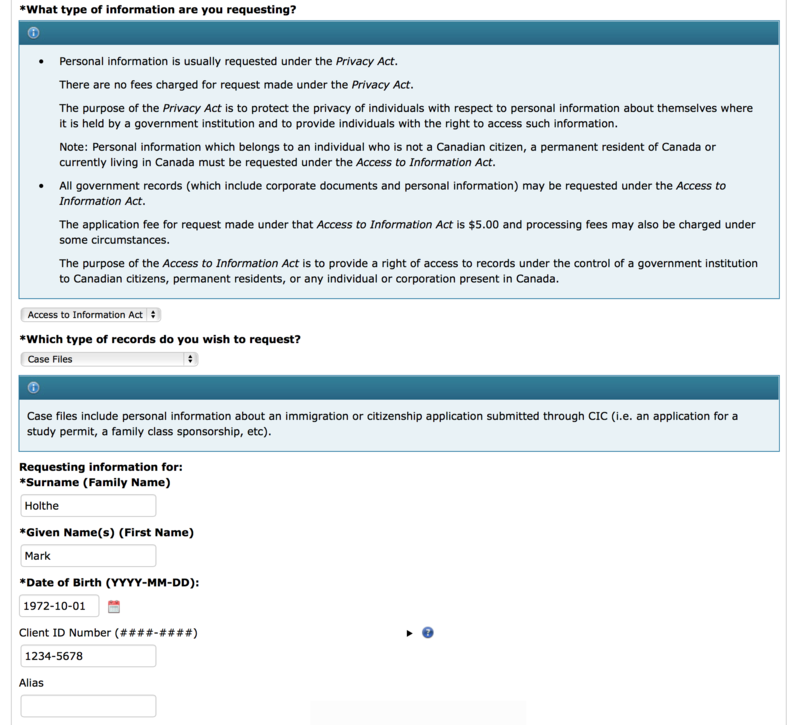 If you are requesting information for your own file, select “Yes”, but if you are making the request on behalf someone outside of Canada, then select “No”. You will also select “No” in the next drop down menu because you are requesting the visa office file notes on behalf of a living person. 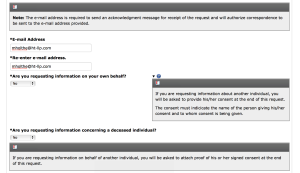 Obviously, you will then need to provide a copy of the signed consent form when prompted to do so. 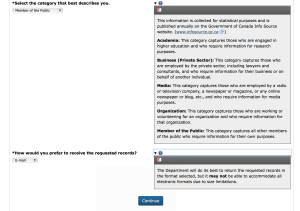 Step 7 – Next you are asked to select the category you fit within. This is not mandatory, so you may skip this section. However, if you want to provide this information to the government for statistical purposes, I indicate “Business (Private Sector)”; however, you would likely select “Member of the Public”. You can suggest the best method for receiving the information; however, if the file is too large, they will send it in a CD format regardless of the preference you selected. Once this has been completed, click “Continue”. 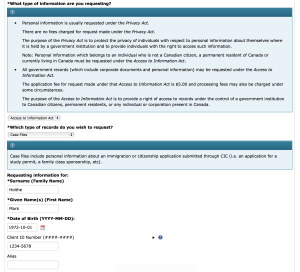 Step 8 – On the next page you will be prompted to answer whether you would like to make a request under the Privacy OR Access to Information Act. When requesting visa office notes, you are doing so under the Access to Information Act, so choose this option. You will then be asked the type of record you wish to request. Select “Case Files” and then complete the requested file information. In order to ensure complete accuracy, I would take this information from the visa office refusal letter. I have set out below a sample letter which lists the pertinent information you will need to fill in. I have blocked out certain sections for privacy reasons. Although not mandatory, you will also be asked to provide the person’s Client ID number which is also known as a Unique Client Identifier (UCI) number. I highly recommend that you include this number if known. See the sample work permit refusal letter below. Step 9 – Once you have completed the basic file tracking information, you will be asked what type of information you would like to request. Although it may take a little longer, I routinely request the “Physical File” so that I am able to obtain the complete picture. At times there is important information related to the refusal that is not contained within the “Notes in the Electronic File”. Once you have selected “Physical File”, you will then choose the “File Type”. Simply select the option that pertains to your refusal. For any work permit, study permit, or visitor visa application, you would request “Immigration File: temporary residence”. You are then prompted to insert the “File Number”. This is critical, because without it, you can not make the request. 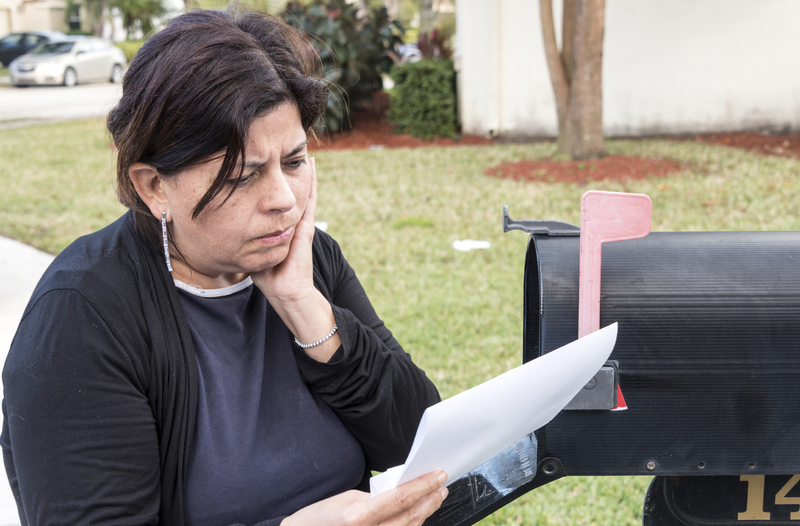 The “File Number” or “Application no.” can be found on the top right of most refusal letters. Step 10 – You will also note that there is an open fillable field at the end of this page where you can provide any information that may help an officer to know what exactly you are looking for. However, I often don’t worry to much about this because if you are requesting the entire “Physical File”, then you should receive everything anyways. If you would like to insert a specific request, you could include something like: “Please provide all notes on file pertaining to the application identified above”. TIP: If this is a sponsorship application, get a consent form signed from every party otherwise CIC may redact critical information from the file for privacy reasons. 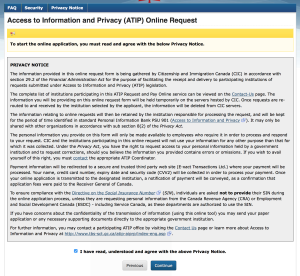 Step 11 – We have reached the final stages of the ATIP request. 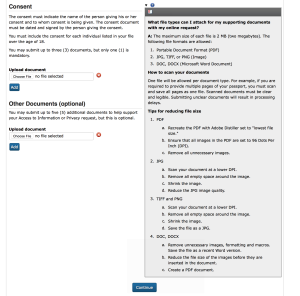 This next page is where you upload your documents and consent form (if applicable). Please note that if you are requesting an ATIP on behalf of someone else, it is mandatory you upload the consent form (IMM5477: Consent for an Access to Information and Personal Information Request). TIP: If you have multiple consent forms, you can simply click the “Add” button and a new field will open up to upload a second or third consent form. 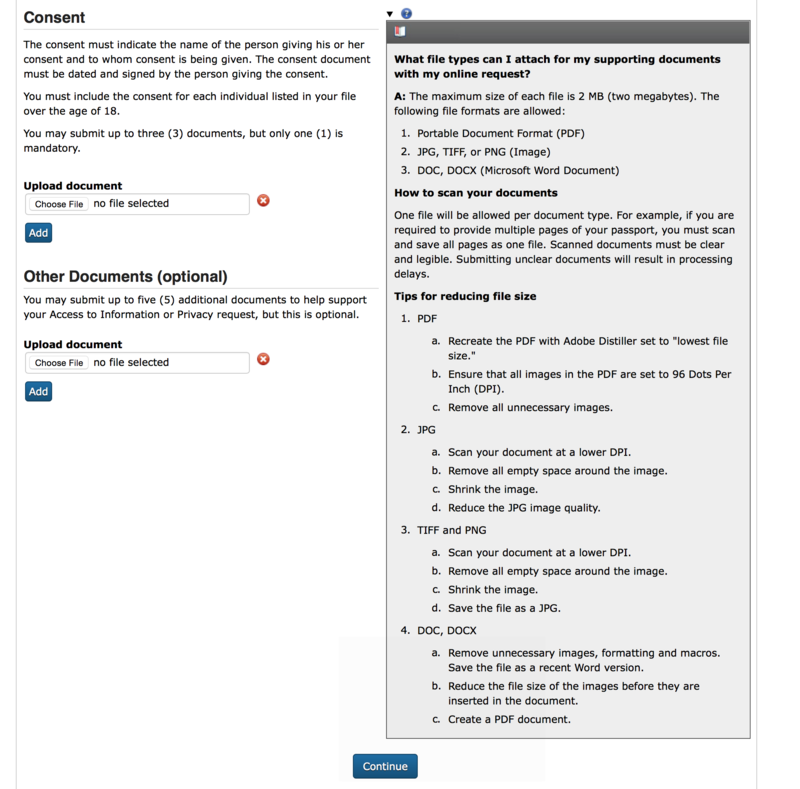 Make sure that the documents you upload fit within the file format parameters set by CIC. Any additional documents are to be uploaded within the “Other Documents (optional)” section. TIP: Although other information is not required, we recommend that you also upload a copy of the refusal letter for good measure. Step 12 – You will need to review all of the information you have entered and pay the processing fee. Be sure to review the information you have entered thoroughly as mistakes could result in the refusal of the ATIP or delayed processing times. You have the option to modify each section. If you find a field you wish to modify, simply click the blue “Modify” button and you will be taken back to the original page in which you entered it. Be sure to save your changes. TIP: We recommend printing this page for your records. If something goes awry down the line you will have proof of the submitted ATIP and will be able to make a case to CIC if necessary. If you have reviewed all your answers and are satisfied, check off the “Certification” box at the bottom of the page and click “Continue”. Step 13 – The last step is to pay the processing fee. The fee for an ATIP is $5.00 CAD. The only accepted method of payment for the online application is credit card. After you have entered in your payment information and have submitted it your transaction will be processed and a receipt will automatically be generated. Be sure to keep a copy of this receipt as well for your records. CIC will now process your ATIP application. They will send it to you by your indicated method (E-mail or CD). Typically, an ATIP request should take no longer than 30 days. However, if you are requesting a Physical File from a consulate abroad, it will often take up to 60 days, or on rare occasions even longer. If 60 days have passed and you have not received your requested information be sure to follow up with CIC and provide copies of your receipts and submitted application. 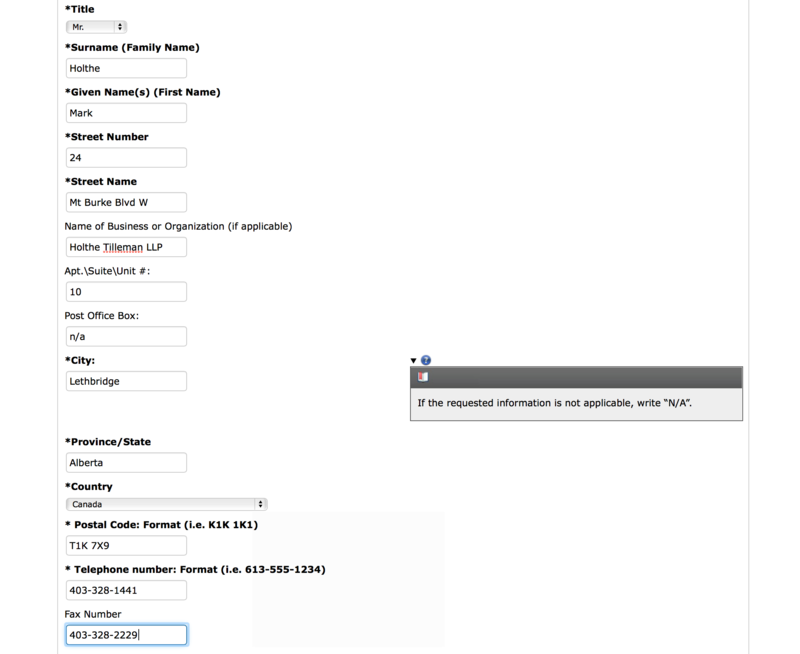 After you have received your requested file materials you will be able to see exactly why your application was refused. With this information you are now armed with the information you need to refile your application again and give yourself the best chance of success. Have you had your Express Entry application returned, or refused? 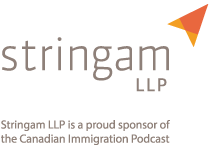 If so, let me know and I will share in Season 1 – Episode 3 of my Canadian Immigration Podcast, some helpful suggestions for improving your chances of success on the second attempt. If you want to listen to my podcast episodes, you will find all the episodes here. If you have enjoyed this blog, you will most definitely enjoy my podcast, please subscribe. A few days ago i received my letter of acceptance from a Canadian flying school located in Vancouver, BC. Also, i had received my IELTS results with an overall score of 7 bands respectively. I am checking to make sure if i am eligible and can get a study permit for the commercial pilot course. Note- In 2010 i had applied and received a study permit for the same course in a different college in Pitt meadows, BC. After completion of 70% of the course I flew back to India for my sisters wedding with an assurance from the college owner that he will provide me with all the required documents needed for renewal of the visa, to which he never obliged and after making few excuses he said he will take all the money resting in my college account and not provide me with any documents. I had filed a complain with PCTIA which is the regulatory authority in British Columbia. My question here is, can I apply for the same course after all these years and is there a problem if any in my case in obtaining a study permit. Furthermore, as i have gathered all the required amount needed for the pilot training course (renewal and further completion) i am planning to apply for the study permit. kindly, understand and suggest me what best can be done in my case. I applied for Canada student visa in 2008 and got rejection. I would like to get the information from Canadian Embassy. I need to find the documents i submitted with the embassy. can i get that information and if yes what is the procedure? secondly, Should i write to Canadian embassy in New Delhi, India or online to IRCC? I have my sister living in Canada who can fill online application. 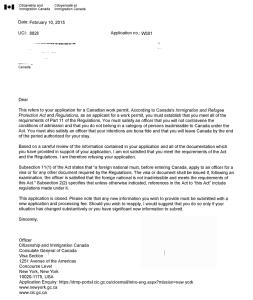 Just recieved my refusal letter for applying work permit saying they are not satisfied that i would leave Canada after my contract reasons are:employment prospects in country of residence, and current employment situation.I am planning to reapply can you please give me an advice what to do and what addtional information can I add in my apllication.thank u so much! Your reply so much appreciated. I am Chandan Narayan. Basically from India, but currently in South Korea, for my Doctoral course. I just got rejected of my visitor visa, again with the same old generic reasons. I would want to apply for the ATIP. But I really wonder, How is there no option of calling the visa office directly and talking to any concerned officer regarding the issues. I have submitted every other document, but do not find a way to ask for a review. I saw that ATIP will take a minimum of 30 days, but again applying, and if successful, will get the visa only after a 3 month period. But I have my conference in 45 days from now. Any suggestions? I have applied for canadian study permit. But I were denied for visa, as they mentioned “other reason”. I have compelted my 12th grade with 80.33% in 2015. I have 6.5 bands in IELTS exam. I have showed more funds than the require funds. I put my file on 14 june and got refusal on 21 july. I have again reapplied for study permit with jusrification letter. I have selected massage therapy course 2 year diploma(requirements-biology and computer practical). Biology subject i got 86/100 marks and in computer practical I got 45/50 marks. Please suggest I may get visa?? Hi Chandan, did you apply for Visitor Visa both in South Korea as your current Country of Residence and not in India? Thank you. I applied from South Korea, as Its my current address and i do not think i can apply from India. Thank you for your reply , hope you will get visa approval on your third application. My parents got rejected for the tourist visa to visit me in Canada. In the refusal letter officer invites us to reapply if we can address the concerns like ties, proof of funds, travel history. I am waiting for CAIPS right now, but my question is can I reapply in a month with the same document and same application forms (dated July 30/2016) just adding cover letter, addressing the issues or do I need to fill out new application forms and ask for the new employment letters etc.? In general, what’s the “expiation date” for the supporting documents? Thank you for your reply. Hope you will get visa approval on your third application. My visa application for study permit for langara college,vancouver of september intake is rejected. Please guide me some good way to coperate with this and get my study visa as my classes are going to start soon. Thank you for sharing your expertise and free knowledge to all who are truly seeking help. Your genuine contribution to all of us is much thanked for. My case is, having being refused my PR application because my documents did not reach a day earlier to the CIC dept. The papers were sent to the concerned consulate a day before by registered mail since CIC does not accept hand delivered documents. While the registered mail was on its way, the following day, I received a “refusal email” from CIC. All documents were in-order as requested by the CIC dept. Was then given an opportunity to appeal. Therefore the appeal was made (now in process waiting to hear from the appeal dept). Question 2: If re-applying, was curious to know will I need to go through all the document process again or submit only the documents that were delayed because of being registered mailed and could not reach the officer on time? Hello, please i have question. I just applied for my visa and they will refuse me for the second time since my husband have a PR. The refuse was because i have not proof of work and relationship . Do you have any idea ?? What is the solution !? hi, i’m amandeep kaur nd i got my canada visa refused on 13th august. I dont know the particular reason behind that.pls suggest me the better guidence for reapplying. thanks for this useful information Mark! Thank you for your amazing article. I want to tell you a little bit about my story and see if you can help me, I am in quebec, and I want to study here so I applied for my CAQ and it was approved, so I make my study permit application, which was denied because “I didn’t send the CAQ” and “I am not convinced you will leave Canada”, when I check my application I saw that I DO make a mistake, I send another document instead of the CAQ! !, so I re/apply and I send the documents right and also I send a Letter of explanation telling them why I want to make this program and explain them that I make a mistake in my first application. Do you think I have a good chance on been approved this time? I am really worry, I have a limit date to get the study permit to my institution. I apply for the second time on August 1, but I have not receive any respond yet. Is there any stated time limits to reaplying against refusals. My letter did not state a time frame! confused reg that rule if any? HELLO SIR! i have refused canadianstudy permit dates18 aug 2016. i ave the right to appeal, i have been since preparing additional docs and my persnal letter andient of study letter. should submit repliction by ed of next week. i had a quick query regardng the impact filling ot the wong informaion by misake have on a reaplication appl. where the mistake made earlier rectified!? i had stated ‘no’ in background point info 2b and i’ll corect that and state yes with approproate details, in my appl form while reapplying. I would like your expert comments on what if any affect that might have on the visa officers decision making (thought process) ?? Thk you for your promt repy! * have been, dated, i have, personal letter, intent of study letter, reaplication, by end, * mistake is later rectified, *kind regards ! Thank you very much for your advice. I was just informed by the CIC that my application was refused due to lack of reasons to come back to my home country, the Philippines. My scheduled trip is this year. The following were ticked off as reasons for rejection: travel history, employment prospects in my home country, and personal assets and financial status. In my application I included a certificate of employment that proves I’m under contract until next April, payslips, bank certificates and statements. I’ve shown several trips made to Europe and around Asia in the last 6 years. I’m not sure what more to give. I am concerned that if I apply for an ATIP I won’t get it in time to send my second application. Also if I get refused twice, how does that affect my chances of future visa approval for other countries too? Hi! I have had 3 denied tourist visas from the US and I am planning to apply for a student visa in Canada. What are my chances of having the visa approved? do you provide help with getting ATIP? This has been an interesting read , we have been to Canada this year but before the deadline of Sept 16 th having to obtain an ETA , but we still sent an app of my husbands was excepted unfortunately I was not that lucky I might never be albe to visit my friends again in Canada again a country that I love I’m devastated but don’t know where to turn , could u pls send me some information on a way forward with this situation , thank you . Let me first start by saying that your article, “What to do when your Canadian visa application is rejected” is very well written. I have a follow up question. How long does Immigration retain paper files at the embassy? My friend’s study permit was refused by the Canadian High Commission in New Delhi in 2010. It has been six years since the study permit was refused. Will the embassy still have the paper files? 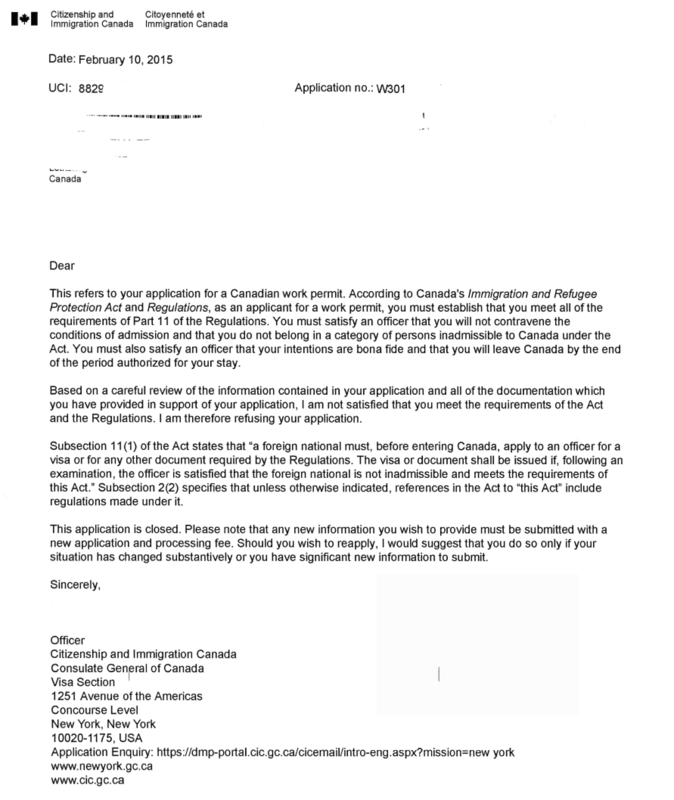 My brother helped me to request for an ATIP after I was refused student Visa. When we got the ATIP the summary states: “Refused on bonafides,funds Applicant states his studies for Biochemistry at University of Regina will be sponsored by an uncle and the brother-in-law. I am not satisfied as to why an uncle (with no proof of relationship) would sponsor these studies and sister has not provided proof of relationship or funds. Given lack of funding I am not Satisfied as to the true purpose of travel. Further not satisfied other funds are available for study….” This information about my application is absolutely wrong. Firstly, I’m a female, I didn’t apply for biochemistry, I didn’t apply to University of Regina, I never stated my studies would be funded by my uncle. All these information are false and I feel this is why the application was denied. We contacted the ATIP officer, but he/she replied ATIP office is not in charge of dealing with this kind of issue. I’m currently stuck and don’t know how to proceed on this issue or who to contact. Your help on who to escalate this to would be appreciated. kindly assist. Thank you. Wow. I cannot thank you enough for this guide! 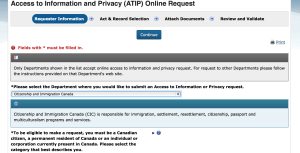 I just found out today that you can find out the detailed reasons of visa denial, but I was very confused once I got to the atip website, until I found this post. Seriously, this is absolutely invaluable. Keep doing what you do. Thank you very much Micaela. 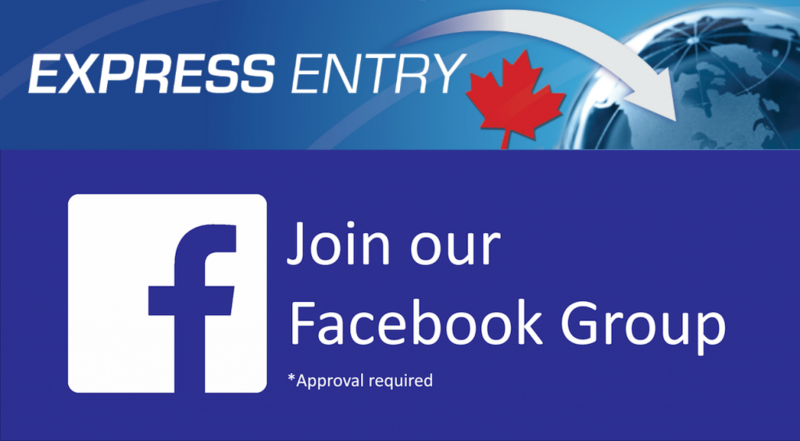 Please feel free to leave a positive comment on our Canadian Immigration Podcast Facebook Page as well. I would really appreciated it. – Would it be better to retain a lawyer for my second attempt under whatsoever notes given? I recently have rejected for Canada visa. I complain the refusal reason. They answer me again after one month. The reason that they sent for me is as bellow and I have a chance to complain again during the following 60 days. I am maxwell from Ghana.I was refused student visa this year based on insufficient funds,travel history,purpose of visit, personal asset and financial status.My sponsor provided enough funds to proof he can pay the fees and have alot in excess.I attached my admission letter and a personal asset that my mother bought for me.I have not traveled to any country because i do not want to waste money and this is the right time for me to travel and study. I am 21yrs and i am surprised when i was refused on my financial status.My mother wants to put part of my fees in an accounts that she wants to open for me.I want to know if it will help in my next application. I am HAIDER Syed Zulfiqar an FIH International Grade-A Hockey Umpire of World Hockey from Pakistan I have been visited entire the world several times. I have also been visited Canada twice in 2012-13 & last time I have issued a multiple visa of Canada. But unfortunately my passport on which the said visa of Canada & USA valid visa were embossed was lost. I have reported the both embassy about the lost of my passport & have applied for replacement visa accordingly but the both embassy were directed me that I may apply for new visas instead of replacement. Now I have applied for new visa which has been refused by Canadian Embassy & alleged a refusal of “Purpose of visit”….? I was much surprised about the allegation, because I have already issued the twice visas of Canada with the same purpose of visits? Now I want to apply again for a TRV kindly help me how I can apply for that & My lost passport it has been received by some unknown person through courier. Regards. Hello, I’m applying for Study permit in Canada. My US visa was refused under 214(b), will this thing can affect my visa? I’ve 6.5 ielts and applying through SPP process. I feel blessed by this post and for that I am grateful. I just wanna get a clearer understanding on something. My question comes from the second paragraph under the “what happens next sub-heading”. Now I intend applying for a physical file via a friend of mine who has got his PR and is based in Canada. Hence the reply would be sent directly to him after which he will send to me in Nigeria. My question is how long would it take him to get a response since it is not from a consulate abroad 30 days or 60days? My study permit got refused because I don’t have traveling history. what can I do to get it approved ? I want to reapply for new study permit. Hello, thank you for your post. I am an F1 student currently working in New York. I applied to Canada tourist visa online. And the reason of rejection is that I did not submit my I-20 (proof of F1 status in America). There is no guidance for me to do so and the officials did not reach out to me to submit additional materials. If they did, it is a matter of seconds for me to email, fax or upload the I-20. I tried calling or emailing them because missing documents should not be a reason to close my application completely, without reaching out to me first. But i have never heard back. Could you please opine on what I should do? Thank you for posting such a complete and easy to understand guide to complete the Access to Information and Privacy online request. Your guide made it fairly easy for me to apply to get additional information on behalf of my cousin whose Temporary Residence visa application was denied. The form letter indicates “travel history” as the reason for denial of the visa but provides no help at all as to what they found lacking or objectionable. What if I was denied in the visitor visa extension? How much time can I stay in Canada in legal status? The same reason why my study permit application was refused. I want to reapply what can I do to overcome the issue of travel history ? This is probably one of the easiest things to overcome. Just travel more. I don’t know where you live but travel to nearby countries. Canada wants to see that you’ve been to other countries. I have to overcome this too since I had only visited 2 countries when I applied. I will try to apply again next year and by then I should have visited 5 countries. Perhaps that will work. The reasons I got rejected was because of lack of travel and due to family ties in my home country except that everyone in my family lives in my home country except my sister who lives in Canada. I was also 35 at the time I applied, unmarried with no children so perhaps they thought I would overstay which is not true at all and I’m not just giong to have 3 kids just to prove that I have greater ties to my country. ++ IN ADDITION, p A IS 30 YRS OLD, BONA FIDES IN QUESTION. I’m a Construction Engineer with 9 years’ work experience and I applied for a Construction Management Post Graduate Certificate Program (Length of program is 2 years). My bank statement that I have attached to my application does NOT show any recent deposits or recent infusion of funds as per refusal letter. I have rather had these funds in my bank for the past 2 years. The mistake that led to the quick refusal is perhaps happened because I converted the bulk of my funds from my saving account into time deposits that might show in my statement to an inexperienced officer as infusion of new funds/recent deposits. I applied for a visitor visa to Canada couple of times before between 2012 and 2016 and I was refused. This was mentioned in the officer’s Note 8. Being of age 30 does not mean I have false intention to study Construction Management. What would be my best course of action, to contact the Visa Office Program Manager or the Case Management Branch at NHQ to request that the application being re-adjudicated, or is it better to for me to go ahead and proceed with an Application for Leave to commence Judicial Review at the Federal Court of Appeal? Very helpful. All the best to you. Thanks so very much Janet. My brother temporary Visa was just denied recently. I thought to send the Immigration Officer a complain letter as I believe his Visa was denied unfairly. He traveled from Iran to Turkey just for his interview and he didn’t even get a chance to have the interview. Then a couple of weeks later he got an email of their standard denied letter. How could this be respectful of Canadian embassy when a person travels from one country to another country to have his interview and they only take his document and not even take a few minutes to interview him?